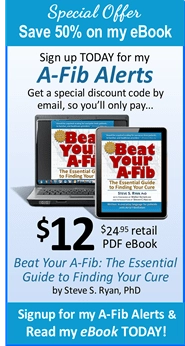 Like all people who have experienced A-Fib I have found it the most frustrating, distressing and debilitating problem. 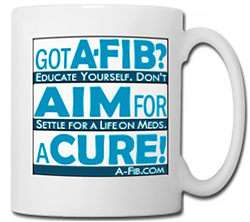 Now, after having had my first A-Fib episode in 1992, I am A-Fib free. 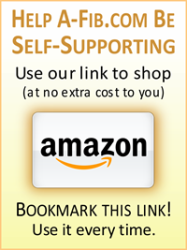 I would like to share my experience with other sufferers. If nothing else, it might provide some hope and at least give some strength to face what is an absolutely lousy problem that is almost swept under the carpet. I remember my first episode as if it were yesterday. I had just returned to the medical ward after having spent two days in ICU following quad bypass surgery in late 1992 and was feeling surprisingly well. Suddenly my heart seemed to go crazy – rapid changes in pulse rate, palpitations and soreness in the chest. My first thought was that I was having another heart attack. Nurses quickly diagnosed it as A-Fib and brought it under control. I was placed on a drug called Rhythmodan, and all seemed to settle down. For the next 15 years I only had rare episodes, usually late at night or early in the morning. They probably occurred about every two months and would only last 30 to 40 minutes. During this period I asked three cardiologists about these episodes, and they all basically told me to simply put up with them. 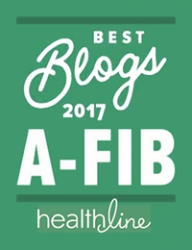 Even in 2010 I had doctors tell me not to worry – A-Fib does not kill you. Of course, this is both right and wrong. The A-Fib doesn’t kill you but the resultant stroke might! During the first few months of 2008 the episodes became more severe and more frequent, but still lasted less than an hour. Then, in April 2008 I suffered another heart attack necessitating my second round of bypass surgery to redo the graft done first time around. I did know that the grafts would not last forever; but when I was told I would have to have CABG again, I was devastated. I found the first surgery to be far less traumatic than I thought it would be, but the second left me very distressed and depressed. I had been warned about the additional risk but was not prepared for four days in ICU, a second visit to theatre because of bleeding, and then kidneys and liver that didn’t want to recover. Then, a worry that I had suffered from a minor stroke. I really don’t want to go through that again. Anyway, I survived. And around six weeks after discharge from the hospital, I started rehab classes. I had only been going several days when one morning while using the treadmill, my heart rate suddenly went to almost 140 bpm, and even after 10 minutes of rest remained at over 120. I was “escorted” to the ER and quickly diagnosed with both atrial flutter and AF. Regular doses of Amiodarone brought the arrhythmias under control, and I was told to see my cardiologist ASAP. Around September 2008 after seeing my cardiologist, my medication was changed from Amiodarone to Sotalol together with Aspirin. He explained that Amiodarone was a very toxic drug, and no patient should remain on it for very long. For the next 10-12 months I continued to have mild episodes of A-Fib. Then just prior to my Cardiologist visit in September 2009, they became worse. After wearing a Holter monitor for five days which clearly showed both the flutter and A-Fib, and being placed on Warfarin, it was suggested that I make an appointment with an EP to talk about ablation. The EP seemed loathe to do anything about it at the time but did explain the ablation options. Given later actions I still do not understand why he didn’t take any action then. During the first few months of 2010 the episodes became far more frequent, distressing and debilitating. Whereas previously they occurred once every couple of months, lasted perhaps 45 minutes and were not too severe, they were now occurring every second day, lasting up to several hours and were very distressing in their severity. In May 2010 after being fed up with being listless, having a light head, headaches and being totally wiped out, I called my cardio and made an appointment. As soon as he heard what I had to say, he called the EP and asked him to carry out an ablation as soon as he could. Initially I assumed that he would be able to tackle both the flutter and A-Fib at the same time. Unfortunately, he decided to only do the flutter. On 22nd July I entered the hospital around 7.30 AM, was out to it by 1 PM and back in the ward by 3 PM. When I came to, I immediately felt that things had improved. The procedure used RF ablation and was totally painless. Over the next few days I was a new man, but I realised that the A-Fib would return some time. It was back less than a week later, but I have never had any more flutter. Editor’s comment: Current research indicates that a Flutter ablation in the right atrium has little chance of curing A-Fib which generally comes from the left atrium. 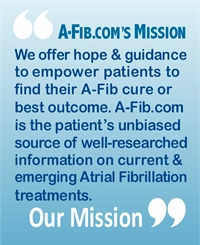 To avoid having to do two ablation procedures, most centers now do A-Flutter and A-Fib ablations at the same time. 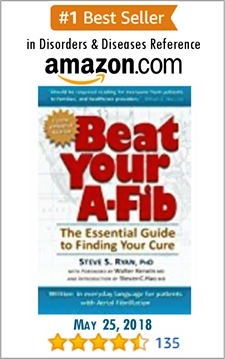 By September 2010 the A-Fib had become unbearable, and I was a very miserable old fellow. At times I experienced several episodes a day. They could last several hours or more. And the worst ones felt like I had a maniacal bass drummer hidden away in the chest cavity. I made another appointment with the EP, Dr. Malcolm Barlow at Lake Macquarie Private Hospital in New South Wales, Australia, for late October 2010, hoping to have a solution presented. He explained that his approach to A-Fib was to use cryo-ablation, and that it was around 70% successful. The cryo-ablation is done using an Arctic Front CryoBalloon system (see the Arctic Front web site for details). He warned me that there were risks of stroke and damage to the phrenic nerve that would leave me with breathing problems for a few months. After discussing this with my very dear wife, I decided to go ahead with the procedure. A couple of days prior to my admission to the hospital, I had the worst episode I had ever had, almost leaving me in a faint at a local shopping centre. I was admitted to the hospital on the 16th December 2010 at 6.30 AM. The procedure started at 9.00 AM, and I was back in the ward at midday, although I don’t remember anything before around 3 PM that afternoon. I was discharged at 9.30 AM the next morning. And now, nine weeks later, have been totally A-Fib free. I told my wife that I felt I was a bit of a fraud – one night in hospital, a few hours I cannot remember, absolutely no pain and very little discomfort, and here I was a new man. It feels absolutely marvelous, and I really do feel like a new man. The only minor crisis I have had since was due to being taken off all the heart medication – Warfarin and Sotalol. The EP did not warn me that my pulse rate would increase significantly before settling, and I would also have more Ectopics. Around four days after taking the last dose of Sotalol, my pulse rate had risen to over 100 bpm, and I was suffering many Ectopics. A visit to the local ER together with a good check-out and call to my EP set my mind at rest. I don’t know whether my success can be generally applied, I can only say how wonderful it has been for me. I hope this has not rambled on too much, and that someone will find it useful.